Papers Please was undoubtedly one of the biggest indie successes and showed that indie games can be something way more than just casual experiences. 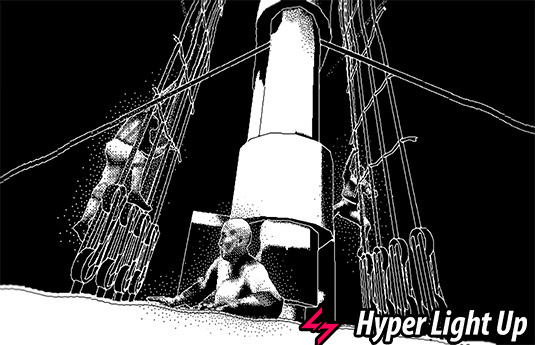 Five years later, its creator Lucas Pope returns with the first person investigative mystery game, Return of the Obra Dinn. Did he succeed in giving us once more another unforgettable experience? Let’s find out. The Obra Dinn was a merchant ship that carried trade goods from London to the Orient. Lost at sea for five years and having never reached its destination, it appears back at Falmouth port, damaged and with its crew missing. You are an insurance investigator for the East India Company and you have to prepare an assessment of damages on the ship. Obra Dinn is a first person investigative game that puts you on board the ship and has you looking for clues about what was the fate of each of the 60 person crew and the ship during the time it disappeared. As you board the ship, you have two items in your inventory that will help you in your investigation. First one is a book that has a manifest of the crew with a sketch of all of them, a sketch with the decks of the ship and sailor lingo for words that you might not know the meaning. Your goal is to fill in each of the names of the sixty passengers, how (and if) they died and what was the cause of their death. To figure this out, you use your second item, a magical pocket watch that has the ability to transfer you back to the exact moment a person died. You see, on the ship there are scattered bones from some of the unfortunate sailors. By using the pocket watch on one of them, the screen goes dark, you hear a few seconds worth of audio (that can range from dialogue between people to agonizing screams) and you end up appearing in the exact moment that person died, in a scene frozen in time but with you being able to walk around and examine stuff. As mentioned before, your goal is to find out the names of each person on the ship, how they died and what was the cause of death. Again, IF they died. In each frozen scene you investigate there will be people that interact with each other. It is up to you to decipher the dialogue before their death, to figure out the role of the people on the ship according to what they wear or what they carry, or even according to where they work. If for example you see sailors on the ship mast, then they must be topmen. You can open your book and see the names of all the topmen. You can also see which country they come from and according to their characteristics you can eliminate some of them and have a better chance of finding your person. As far as dialogue goes, the job that has been done on the game is perfect. There aren’t many dialogue lines in game, remember that you hear a few seconds of audio before each person’s death but what is in there is performed beautifully. People have different accents and depending on their role, are played accordingly. Those short lines and the audio clues from sound effects add many levels of immersion to the whole experience. The music is also fitting to the era and incredibly catchy. A job well done in all respects. Another thing that helps with this is the visual style of the game. 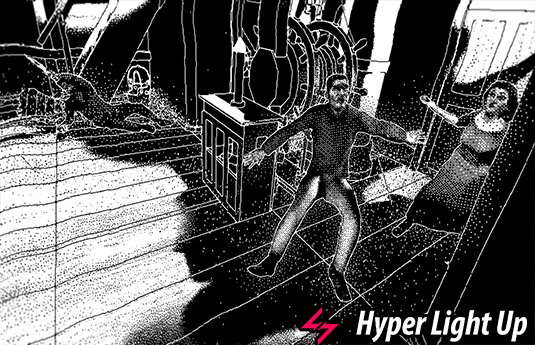 Return of the Obra Dinn has that very early computer vibe, inspired by the graphics on Macintosh or IBM pc’s. That means, monochromatic color scheme, white on black. You see the silhouette of the ship and the characters on white color, with different intensity to accent shadows, clothes etc. This visual style goes beyond being just something novel. Lucas Pope I believe made the game look like that intentionally and I will explain why I think that. This style hides situations and events on the ship without going out of its way to hide them. That means that, if you don’t know what to look for, you will probably miss it. If you do though, and you take the time to carefully look around, you will discover things in the scenes that might surprise you. I have to be vague, we are in spoiler territory here. Obra Dinn is probably the best investigative game I have played these recent years. You have to use logic, pay attention to the scenes and not only that, but watch them from other perspectives too. The game will not help you with pop up hints. Everything you need to know is there and it is up to you to connect the dots between scenes, between person relationships and events. The developer, Lucas Pope, with this game treats us gamers with respect, like adults. If you figure out what is happening (and you will) it’s on you. Your thinking helps you move forward in this game. You are not force fed a dumbed down experience, you are not taken by the hand. It has been a long time that a game felt so refreshing for me in that way. The only thing that I have to note that took some of the immersion away was that near the end I felt that I had to reach to figure out names and death causes. I had next to nothing to go on and I found some fates by using trial and error methods, not just using logic, which I think is the best way to go. I also have to note that I used the LCD color scheme because the other options actually hurt my eyes. This scheme worked with me and I went through the game without problems. I have to confess something here. I didn’t enjoy Papers Please way back when I played it. It just wasn’t my kind of game. Objectively I am grateful for the things it did for indie gaming but still, that game wasn’t for me. Things were different with Obra Dinn. I saw the release trailer of the game and it had me hooked immediately. The setting, the mystery and the gameplay mechanics were things that spoke to me. I am a fan of sailing stories, sea myths and the general time the game takes place so I knew this was a setting that I would enjoy to explore. I immediately bought the game and not only I didn’t regret it, but it gave me an unforgettable experience. My advice to you is this : watch the release trailer or even the first five minutes of the game (not more, you will be spoiled and believe me, you don’t want that). If it interests you even just a bit, go and buy it. You can find Return of the Obra Dinn on Steam for the price of 16,79€. 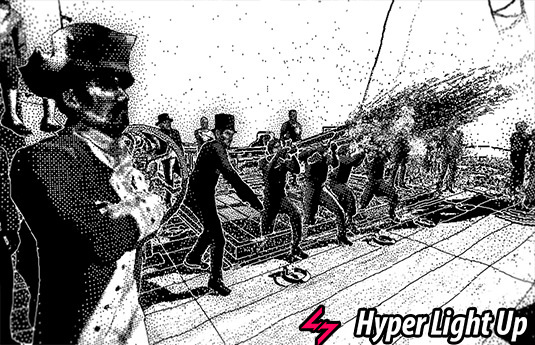 Return of the Obra Dinn is an experience which reinforces the opinion that indie games can be something way more than casual ways to pass the time. With its 19th century setting, the engaging mystery story and the incredible work on the visual and audio department, it creates an unforgettable experience to people who enjoy investigative puzzle games and not only. It is my favorite investigative game that I played these recent years and raises the bar for what’s to come in the future. A masterpiece.